Above Photo: Berkeley High School students rally on November 5. Twitter/@Jacket__Pride. More than a thousand high school students in Berkeley, California walked out of class on November 5 in a protest against racist threats left on a school library’s computer in support of the Ku Klux Klan and threatening a “public lynching” next month. School district spokesperson Mark Coplan said that no hacking or actual changing of the school library’s website was involved. Instead, the messages were part of a displayed image that someone left open on the computer screen. Later that night, Berkeley High School’s Black Student Union tweeted a photo of the computer screen for everyone to see and released a statement. The school’s principal, Sam Pasarow, also sent out an email at around 10:30 p.m. on Wednesday night. The next day, Berkeley High students Alecia Harger, Nebe Zekaryas, and the rest of the Black Student Union organized a walkout, rally, and march to spread awareness of the incident, as well as racism in general on school campuses. Early on Thursday morning, students walked out of class and held a rally at the community center on campus where Berkeley Unified School District Superintendent Donald Evans, Principal Pasarow, students, and members of the Black Student Union addressed the crowd. After the speeches, students began walking off campus through Martin Luther King, Jr. Civic Center Park and headed toward Old City Hall. 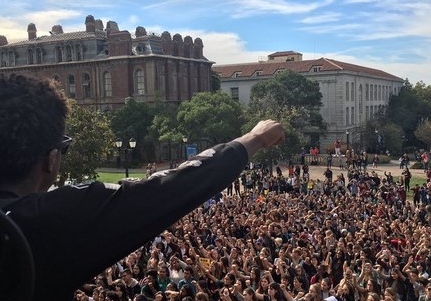 After hitting Old City Hall, the protesters then marched through the streets and arrived at UC Berkeley, where they chanted “You’re the ones who showed us how, UC Berkeley join us now,” “Black lives matter,” and “No justice, no peace,” as they marched through the university’s campus. The protesters made more speeches once on the UC Berkeley campus and thanked authorities like Principal Pasarow for supporting the march and the students. Pasarow then raised his fist in solidarity. He also promised to hold an all-school assembly on December 9, the date that the racist messages said would include a “public lynching,” examining the contributions of the black community. Shortly before 1 p.m. the protest ended and Berkeley High students made their way back to their school. No arrests or confrontations were reported by police. This particular racist incident follows two other incidents over the past year, including a noose left on a tree at the school in October 2014 and an incident earlier this year in June where a message in the yearbook referred to a group of students of color as future “trash collators” (sic). Despite these incidents, Thursday’s walkout and protest was well-attended, peaceful and widely supported by school staff and local school officials. It also ultimately pushed the student responsible for the threats to confess while bringing together many of Berkeley High’s students.